The first known research on the European ancestors was made by Samual John (Jack) Anthes of Lithgow prior to 1979. 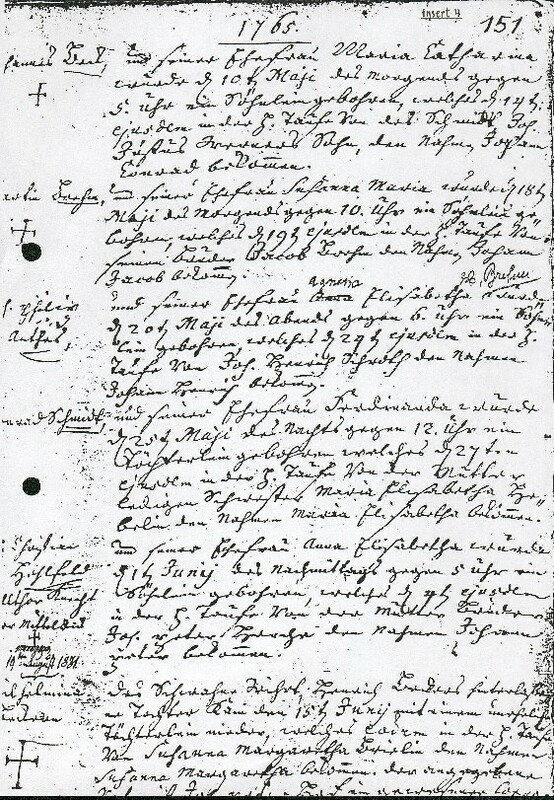 From the visit of a friend to Germany he was able to determine that the birth of Friedrich Ludwig is recorded on page 615 of the Frankfurt Birth Register. On page 487 of the Register of Marriages is recorded the marriage of his parents, johann Friedrich Anthes and Maria Elisabetha, nee Schenck. Using that information as a starting point, later separate enquiries were directed to the Frankfurt Statarchiv office for extra details. These were supplied but the information on records prior to 1851 were directed to a second agency in Frankfurt. The second agency provided details back to the early 1800's but requested that enquiries for an earlier period be directed to church records held in Langen. The three record sources provided details for four generations of children with mention of direct parents or father for a further four generations. These records show the first three generations to be born in Gross Gerau, the next three at Langen and the final two at Frankfurt-am-Main. Research of church records by the wife of the clergyman at Langen covers partial details of six generations commencing with the earliest information found at Frankfurt and working backwards. It is most likely that more comprehensive details of the family is recorded in the church registers but these are not open for private research. The earliest record provided gives the birth of Wenz Anthes at Gross Gerau in 1550. Wenz is mentioned as a cooper (wine barrel maker) by trade in the entry of birth of his son. It is thought that the region in which the Anthes families lived was fertile and supported vineyards and a wide variety of horticultural activity. Wenz was the father of Hans Anthes who was born in Gross Gerau on 17.4.1578 and died in Russelheim in 1635. Hans had married twice, the second marriage being to Margarita Spengler, the daughter of Peter Spengler, at Gross Gerau in September 1624. Hans and Margarita were the parents of Nicholas Anthes who was born in Gross Gerau on 31.7.1625 qnd died in Langen on 10.8.1693. Nicholas had also married twice, the second marriage being to Dorothea Metzger at Langen on 15.5.1655. Dorothea was born about 1640 and died in Langen in 1693. Dorothea was the daughter of Jakob and Ottilia Metzger. Jakob died in Langen on 21.12.1653 while Ottilia died there 2.1.1676. Nicholoas moved from Gross Gerau to Langen by at least the time of his second marriage in 1655. Nicholas and Dorothea were the parents of Peter Anthes who was born on 15.3.1665 and died in Langen on 13.11.1747. Peter married Anna Dorothea Werner on 16.2.1692. Anna was born on 6.1.1674 and died in Langen on 11.12.1746. Anna's parents were Ewald, born in 1642 and died in Langen on 10.5.1708, and Dorothea Barthel who died in Langen on 22.12.1689. Ewald and Dorothea had married on 24.4.1666. Other notes : The place of death for Johann Heinrich was Arheilgen. The father of Agnesia Elisabetha Brehm was Johann Jakob Brehm. Ewald is recorded as the local baker at Arheilgen between 1732-1744. The parents of Anna Elisabetha Boos were Martin (4.11.1691. died Langen 1.2.1772) and Maria Gertrude Hartung (23.3.1695 - 15.5.1776) The parents of Martin were Johannes, married 16.6.1671 in Langen to Catherina Schickedauz from Sprendlinger. The father of Johannes was Peter who died 24.2.1683 aged 61 years. The first marriage of Heinrich Phillip to Anna Elisabetha Boos produced four children and his marriage to Agnesia Elisabetha Brehm produced three children. Birth and Death details of Anna are not given but Agnesia was born 13.1.1726 and died in Langen on 21.1.1784. Other notes : Ludwig Schneider died 1796. Georg Wilhelm Schneider was the son of Caspar the Joiner (carpenter). Susanna Catharina Liebenau was the daughter of flower gardener Michael Friedrich Liebenau. On May 20th towards 6pm a little boy was born to Heinrich Phillipp Anthes and his wife Agnesia Elisabetha, nee Brehm, who was christened on the 24th of the same month by Johann Heinrich Schwolf who gave him the names Johann Heinrich." 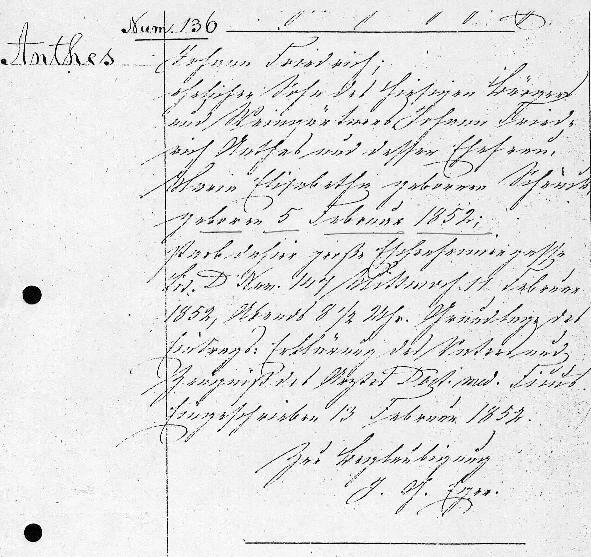 The death record of Johann Heinrich Anthes in Frankfurt gives his father's name as Johann Philipp rather that Heinrich Philipp which is given in the Langen records. Variations to christian names is not uncommon and further examples of this flexibility appears in other records. Johann Heinrich and Susanna Catherina were the parents of thirteen children and his move to Frankfurt prior to his marriage commences the history of this group away from the small towns of Gross Gerau, R�sselheim, Arheilgen and Langen. The records of Johann Heinrich and Susanna Catherina plus those of the next two generations were obtained from the Statarchiv records in Frankfurt. The depth of record requested is not extensive but seems adequate for immediate family lineage purposes. Other notes : Maria Elisabetha Schenck was the daughter of wine growers Jakob Schenck and Anna Elisabetha D�rrstein. The details of Johann Noel are given as Johann Noe but it is thought that the letter 'l; was omitted due to a transcription error. Johann Friedrich, who is recorded as a gardener, and Maria Elisabetha also stretched the imagination and were the parents of thirteen children including Jakob and Friedrich Ludwig who were their first and second born. The birth details only are given here and more expansive details appear in the sections dealing with their Australian descendant families. Interesting is the use of the assignment of christian names to the children of this and earlier generations. In this generation the last two boys born are named after their father and it is likely that both boys may have died prior to the birth of the last child. This may explain why she was given the feminine form of her father's name. 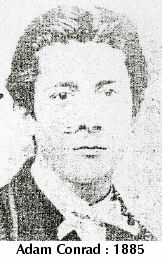 It is likely that Adam Conrad would have been known as Conrad and the death of his brother Adam in 1868 may have allowed him to choose either christian name after that year. A photograph taken in 1885 signed 'Uncle Adam' may reflect this as he is referred to as Conrad by Susannah when she described him in Prussian Guard uniform. The previous generation, children of Johann Heinrich, shows five sons given the first christian name of Johann. It is likely that of the two named Johann Friedrich, one would have been known as Johann and the other as Friedrich, provided the first born did not predecease the second. This would suppose that the other three children would have been known by their second name of Noel, Heinrich and Jakob with Friedrich Carl being known as Carl. Similar duplications of names occur in the two generations prior to that and a similar christian name selection seems likely. Also interesting is the narrow band of names which seem to be usually taken from the parents or grandparents names. Why some children were given one christian name while others were given two and some girls three, is not known. The Statarchiv office supplied a photocopy of the birth entry for the eleventh born child Johann Friedrich born 5.2.1852. No attempt has been made to translate that entry though the date of birth is readable. Other dates shown, 11th Feb 1852 and 13th Feb 1852 may relate to the date the birth was recorded and the date of christening. It can be seen from the photostats of the birth records how difficult it wold be to read and translate these entries. Anthes Family Tree : Germany : 1550 - 1860 from Wenz to Jakob and Friedrich Ludwig. There seems many avenues open for further historic research on the families in Europe prior to the arrival of of Jakob and Friedrich. Without more positive proof of association between the families of Alsace and Frankfurt it appears that their development as family groups is separate from one another but with possible family connection prior to 1731. Both family groups seem to be common with their protestant observation of the christian religion with the Alsace families referred to as Huguenots and both Jakob and Friedrich choosing marriage in Australia as Congregational and Anglican churches.